This site is only for Law Office PC/LLC/LLP registrations. All forms needed for relinquishing your PC/LLC/LLP are located on our forms page. All current PC/LLP/LLC registrations are already active in the system. If you would like to add an attorney, remove an attorney, pay annual registration fees or update your information, please log in via the Corporation button in the upper right hand corner of the screen. You will use the e-mail address you indicated on the 2013 renewal form. This is the e-mail address we have on file for your corporation. If you have a different e-mail address you would like to use, please log in with the one assigned and update the e-mail address under “Edit Agent Info”. If you cannot access the system with this e-mail address please send an e-mail to rule27@courts.in.gov and we will update your e-mail address for you manually. New attorneys will be listed as "false" until we receive the certifications back from the Clerk of the Court and Disciplinary Commission , we will then mark them as "true"
Only register on this site if you are a law office forming a PC,LLC or LLP. You will need to register for a new account. You will register via the Corporations button at the top right hand portion of your screen. Click the red “Register” button and you will be guided through the registration process. 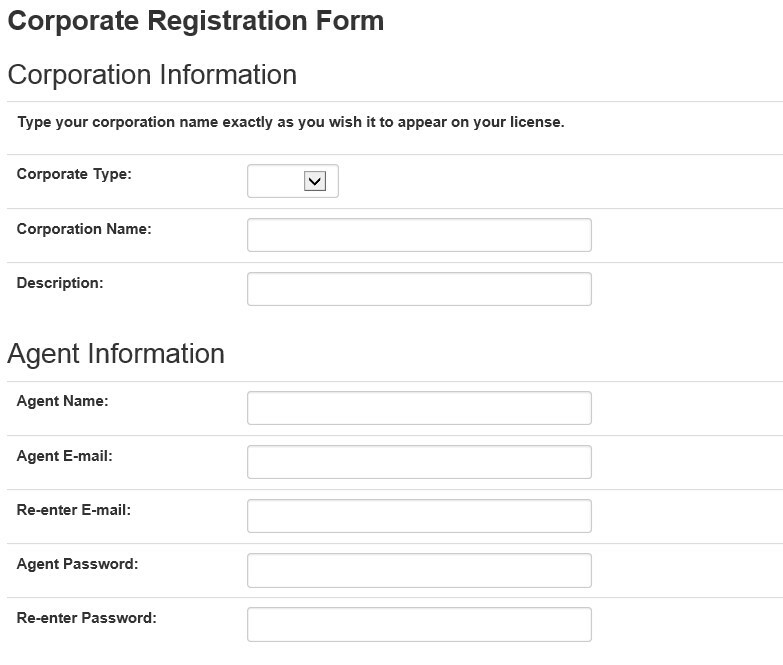 This is where you will indicate the type of Corporation you are registering (PC/LLC or LLP), the name of your Corporation and a brief description. Then you will indicate your Registering Agent’s name and e-mail address. The e-mail address will be the address that we will send all correspondence to, so if this e-mail address should be another person in your office, please indicate that e-mail address in the space provided. You will then choose a password for access to the system. Next, you will indicate the mailing address where all USPS paper correspondence will be delivered. Check your e-mail for your activation e-mail to activate your account. In this area you will indicate the questions above. Once completed, you may continue and add other Attorneys. 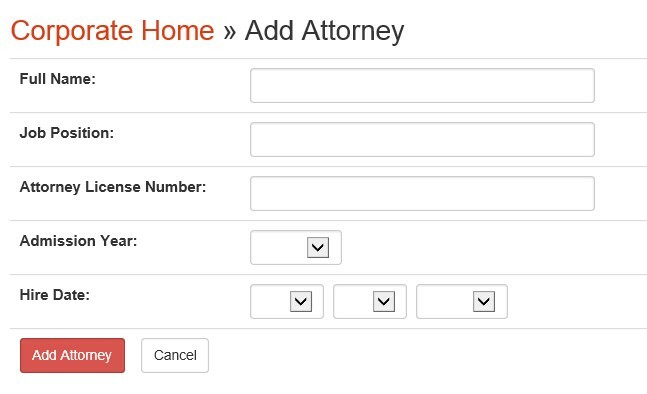 The system will automatically calculate the fees as you add Attorneys. You must upload a copy of your insurance rider. (a) A certificate of registration shall continue in force for one year (July 1 thru the following June 30), and may be renewed for a like period upon the submission of such verified information to the Board of Law Examiners as will demonstrate that the professional corporation, limited liability company or limited liability partnership has complied with the provisions of the statute under which it was formed and this Rule. (b) Each professional corporation, limited liability company or limited liability partnership formed pursuant to this Rule shall pay a renewal fee of fifty dollars ($50.00) on or before June 30 of each year; a delinquent fee in the amount of twenty-five dollars ($25.00) shall be added to the renewal fee for fees paid after June 30 and on or before July 15 of each year; a delinquent fee in the amount of fifty dollars ($50.00) shall be added to the renewal fee for fees paid after July 15 and on or before August 31 of each year; a delinquent fee in the amount of one hundred fifty dollars ($150.00) shall be added to the renewal fee for fees paid after August 31 of each year. Additionally, a one hundred dollar ($100.00) surcharge will be added to the late fee for each consecutive year for which the attorney fails to timely file the renewal form. This renewal fee is in addition to any annual registration and fees paid under Rule 2 and/or Rule 6.